Fits 2WD and 4WD models. Performance Accessories PLS992 Premium Lift System raises the vehicle 3-inches, by combining the companys high-quality body-lift and leveling kit, allowing the vehicle to run up to a 35-inch diameter tire. 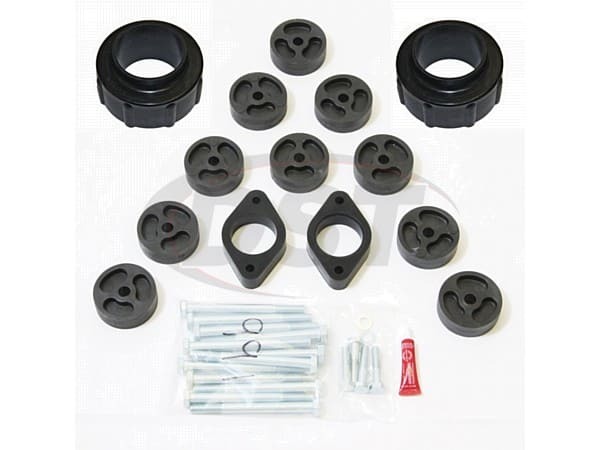 The kit includes 1.3/4-inch high-quality front urethane spacers, high pressure fiberglass reinforced nylon lift blocks, high strength hardware and urethane wheel-well extensions (Gap Guards) that conceal any gaps between the body and frame. This system can be installed in 4 hours and comes complete with everything necessary for installation. NOTE Depending on the vehicle configuration (automatic or manual transmission, 2WD or 4WD, cab length, bed length, etc. ), some parts may not be used.